Lately, I've been feeling less than excited when I get dressed. My clothes seemed utilitarian and plain. I wanted to feel confident in my wardrobe - that it expressed my style while still being comfortable and practical. I needed help. 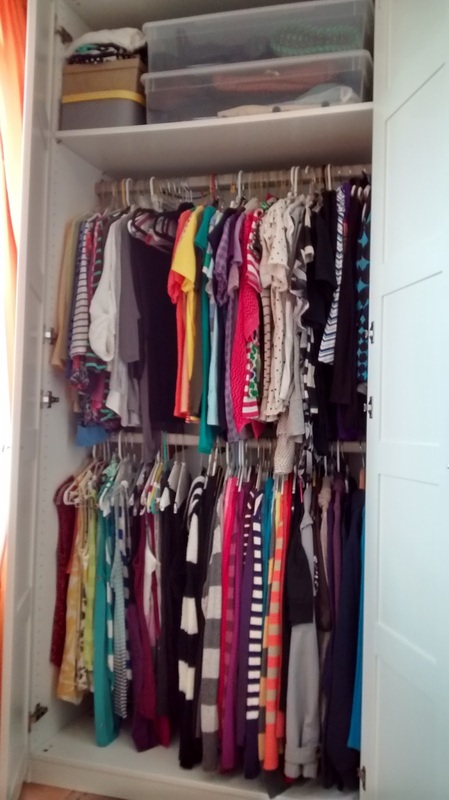 I called on a few good friends to inspire and assist me in purging my entire wardrobe! Before they arrived, I sorted through everything I owned. I left items in my closet that I knew I liked and felt fit me well. I already knew I would be keeping those items. The rest I sorted into two large piles on my bed: clothes that I liked, but wasn't sure if they fit properly and items that fit well enough, but didn't really seem like my taste. Now, let me say that a majority of my clothes have come from attending or hosting regular clothes swaps. I ended up with most of these items not because I picked them out and purchased them in a store, but rather because they were in front of me at a party - and free. Though that doesn't sound like a ringing endorsement, I will admit I also have some great pieces from swaps that are exactly what I want in my wardrobe and/or items I'd never think to try on in a store, but ended up loving. needs/wants. While they decided what was worth trying on from that pile, I started to try on items from the other pile: items I liked, but didn't know if they fit. As I modeled each item, the girls yayed or nayed each piece. The nos went into a donation bag right away, and the yeses were set aside to be returned to the closet after the fashion show was over. By the time I was done trying on the entire pile, I started trying on the items my friends had pulled from the stack of 'fits well, unsure of style' pieces. There were some keepers from here ('Why haven't you worn that; it's so cute!') and some goners ('It's a good color, but it hangs funny on you.'). Goners were bagged and keepers set aside with the other yeses. 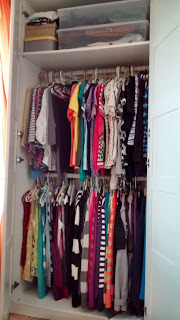 After all was said and done, I had gotten rid of about half of my wardrobe!